Meet Women or Entertain Your Friends with Confidence, Personality and Mystery! With a friends help, you gain a whole level of opportunities and fun. 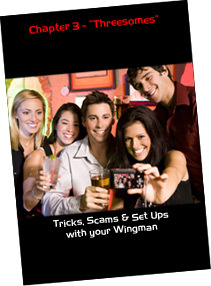 Be sure you and your wingman are familiar with your favorite tricks or scams in order to act fast on your toes. Some of these tricks rely on your friends ability to act uninvolved and be able to give you the credit. Just keep in mind that this is fun for all and not to legitimately take advantage of anyone. You should see how easy and flexible these tricks are depending on the setting, the attitude of the girls and your acting or B.S. skills. Again, I'll remind you to remember to be a gentleman even when scamming someone. Enjoy having "threesomes"!
" Immediately hand the phone over and he does the rest. It will be quite confusing when she explains the trick that is not working and he replies with the correct card because she picked one herself, showed nobody and knows you didn't signal anyone. After approaching a girl, have a wingman time a call to you. Take the call. This will do a few things. One, makes you look like you have friends and other things to do. Two, it gives you a chance to see her reaction to your call. To make her more curious, you could play it off like a girl is calling. Even better, you could tell the caller that you are busy with something important. After the call, you could take a picture of both of you to "send to your friend". What you are really up to is creating some intimacy, mystery and curiosity. Three, this gives you an excuse to run if she is just not worth the effort. Both of you run up to your dream-girl with a list of things you have to make happen for a scavenger hunt contest. The other has to be a witness. You get to her first and he "honors" it and lets you go. You say you had to find the cutest girl and get her to complete the following tasks. He then reads from his list things you have to do with her. You can create your own based on the setting, your personalities, etc. Good starters are guessing things about her and you have to keep guessing until you get ten correct. Obviously, you'd want to lead up to getting a kiss, a date or a phone number. It's a good way to get away with nearly anything to break the ice. You guys could run off afterwards or just end up with her by ending the game by saying, "Aw, Man... You won. You actually got to a hundred points before me." The possibilities are endless with this excuse to barge in on someone. Gain an advantage by secretly using your wingman to trick, scam or set-up your target!  Intimately look into the eyes of anyone you want while doing "mind reading tricks"
 Be memorable so you know she'll call you back!  Have more to say than, "Uh, what's your name? What do you do?" Chapter 3 contains a variety of tricks, set ups, introductions and scams that secretly use a third person... or wingman! No experience required!